The ATF just released their July 2017 newsletter. 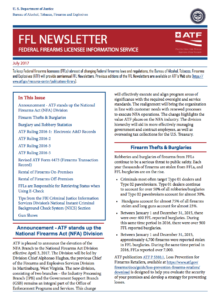 These ATF newsletters are periodically released to help update the firearms industry on internal ATF news as well as clarify and/or explain recent ATF rulings. The best news is about the new NFA Division – we’ve already been receiving reports about MUCH faster NFA form processing times (as little as one dat for Form 3s!). This means that its the perfect time to Get Your FFL. Except for the new NFA division, there is nothing particularly noteworthy in this newsletter. In fact, if you have taken your compliance training from us, then you already know everything that the ATF tried to explain concerning rulings that were released over a year ago. We strongly encourage you to click on the image of the newsletter to view a pdf so that you can read the entire newsletter and save it to your computer if you wish. 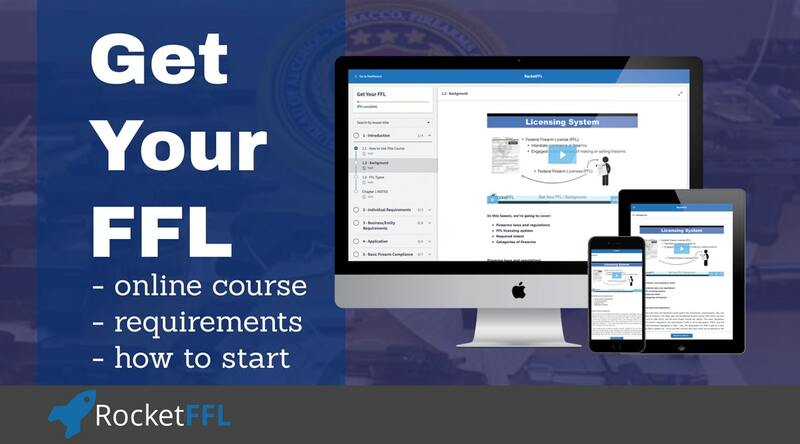 To keep Federal firearms licensees (FFLs) abreast of changing Federal firearms laws and regulations, the Bureau of Alcohol, Tobacco, Firearms and Explosives (ATF) will provide semiannual FFL Newsletters. 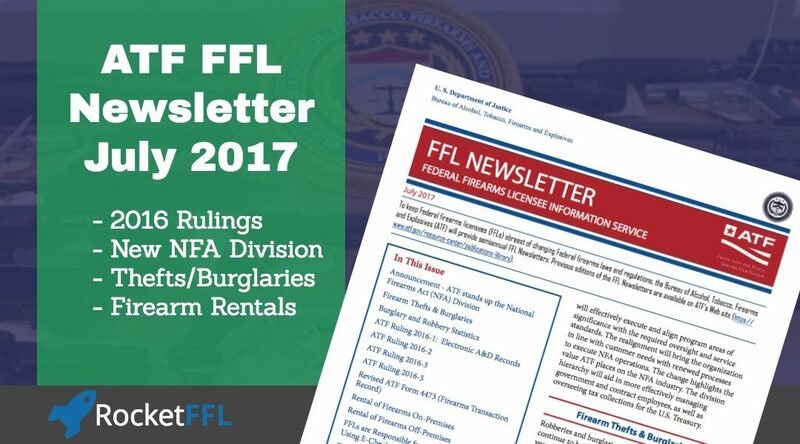 Previous editions of the FFL Newsletters are available on ATF’s Web site (https:// www.atf.gov/resource-center/publications-library). ATF is pleased to announce the elevation of the NFA Branch to the National Firearms Act Division effective April 3, 2017. The Division will be led by Division Chief Alphonso Hughes, the previous Chief of the Firearms and Explosives Services Division in Martinsburg, West Virginia. The new division, consisting of two branches – the Industry Processing Branch (IPB) and the Government Support Branch (GSB) remains an integral part of the Office of Enforcement Programs and Services. This change will effectively execute and align program areas of significance with the required oversight and service standards. The realignment will bring the organization in line with customer needs with renewed processes to execute NFA operations. The change highlights the value ATF places on the NFA industry. The division hierarchy will aid in more effectively managing government and contract employees, as well as overseeing tax collections for the U.S. Treasury. Robberies and burglaries of firearms from FFLs continue to be a serious threat to public safety. Each year thousands of firearms are stolen from FFLs, and FFL burglaries are on the rise. to account for over 50% of all robberies/burglaries and Type 02 pawnbrokers account for almost 30%. Handguns account for almost 75% of all firearms stolen and long guns account for almost 23%. Between January 1 and December 31, 2015, there were over 400 FFL reported burglaries. During this same time period in 2016, there were over 500 FFL reported burglaries. Between January 1 and December 31, 2015, approximately 4,700 firearms were reported stolen in FFL burglaries. During the same time period in 2016, FFLs reported over 7,000. ATF publication ATF P 5380.1, Loss Prevention for Firearms Retailers, available at https://www.atf.gov/ firearms/docs/guide/loss-prevention-firearms-retailers/ download is designed to help you evaluate the security of your premises and develop a strategy for preventing losses. On April 29, 2016, ATF Acting Director Thomas E. Brandon signed ATF Ruling 2016-1 (“Ruling”). The Ruling authorizes licensed importers, licensed manufacturers, licensed dealers, and licensed collectors to maintain their firearms acquisition and disposition records electronically instead of in paper format provided the conditions set forth in the Ruling are met. This Ruling supersedes ATF Ruling 2013-5, Requirements to Keep Firearms Acquisition and Disposition Records Electronically. This section highlights some of the conditions required for FFLs to maintain acquisition and disposition records electronically. This is not an all-inclusive list; therefore all FFLs should reference a full version of ATF Ruling 2016-1, available at https://www.atf.gov/firearms/docs/ruling/2016-1- requirements-keep-firearms-records-electronically/ download. The licensee’s server is located within the United States or its territories, or if a host facility is used, that facility must have a business premises within the United States or its territories, and must be subject to U.S. legal process. Licensees are strongly encouraged to ensure that there are proper and robust security protection measures in place (e.g., encryption) to ensure all data is protected. Additionally, the electronic storage system must back- up the firearms acquisition and disposition records on at least a daily basis to protect the data from accidental deletion or system failure. Furthermore, the electronic system cannot be a combination of paper and electronic records. The electronic system cannot rely upon invoices or other paper/manual systems to provide any of the required information. For example, if a licensee chooses to use an electronic recordkeeping system for any of its required acquisition and disposition records, then all acquisition and disposition records, regardless of type (e.g., gunsmithing, sales, NFA), must also be in the electronic format as prescribed by this Ruling. The licensee must record in the electronic system all of the acquisition and disposition records required by 27 CFR section 478.121, 478.122, 478.123, 478.125(e), 478.125(f), and 479.131. All laws, regulations, rulings, procedures, and policies applicable to the paper form of the firearms acquisition and disposition records also apply to electronic versions. Licensees are not required to use an electronic acquisition and disposition record, and may continue to use a paper record in the format prescribed by regulation. Licensees are reminded of their responsibility to ensure accuracy and completeness of all of their required records. This Ruling supersedes all previous rulings regarding alternate methods or procedures for electronically maintaining firearms acquisition and disposition records, including ATF Ruling 2013-5, Requirements to Keep Firearms Acquisition and Disposition Records Electronically, approved December 17, 2013. Acting Director Brandon also signed ATF Ruling 2016-2 (Ruling) on April 29, 2016. The Ruling supersedes ATF Ruling 2008-3 and authorizes licensees to use an electronic version of ATF Form 4473 provided certain conditions are met (e-Form 4473). This section highlights some of the features of the e-Form 4473 and the conditions required for FFLs to use the e-Form 4473. This is not an all-inclusive list, the FFL should reference a full version ATF Ruling 2016-2, available at https://www.atf.gov/firearms/docs/ ruling/2016-2-%E2%80%93-electronic-atf-form-4473/ download. Licensees may acquire and use their own electronic Form 4473 software or may download the e-Form 4473, available at https://www.atf.gov/ firearms/applications-eform-4473-download. If the electronic signature pad breaks or fails to operate properly, the licensee must discontinue use of electronic signatures and obtain handwritten (ink) signatures on the OMB- approved ATF Form 4473 or the printed copy of the e-Form 4473. Electronic signatures may not be auto-populated from previously captured electronic signatures. Electronic signatures must be captured immediately prior to the transfer of firearm(s). NICS or appropriate State agency to request authorization to transfer specific NICS data from e-Check into the computerized system. 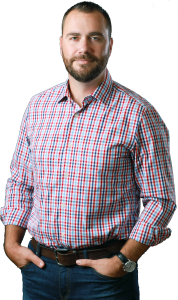 to discontinuance or change of: the software (program), the database system whether or not maintained by a host facility, and/or the host facility; and 4) prior to discontinuance of licensee’s firearms business. e-Form 4473s for pending transactions downloaded to a computer server or device owned and operated by the licensee, or contracted/leased by the licensee through a host facility must be: 1) accessible through a computer server or device at the licensed premises during regular business hours; 2) printed upon request of an ATF officer; 3) searchable by transferee’s last name, address, and firearms information; 4) stored on a server located in the United States, or, if a host facility is used, that facility must have business premises in the United States or its territoriesand must be subject to U.S. legal process; 5) stored on a separate/partitioned database and not intermingled with another licensee’s records; 6) backed up at least daily to protect data from accidental deletion or system failure; and 7) scrutinized to ensure the systems used have robust security protection measures in place (e.g., encryption) to ensure data protection. The e-Form 4473 must be printed, including instructions, at the time the transfer of the firearm is complete and prior to the transferee departing the business premises. The transferor must verify that signature and date are present and in the appropriate fields and printed on the printed ATF Form 4473. All e-Form 4473 Denials, no sales, cancellations, and transfers not completed within 30 days after contacting NICS, must be printed and retained in accordance with 27 CFR sections 478.124(b) and 478.129.The e-Form 4473 is compliant with 27 CFR sections 478.102(d), 478.121, 478.124 and 479.131. All laws, regulations, rulings procedures and policies applicable to the paper ATF Form 4473 (5300.9), Firearms Transaction Record, also apply to an e-Form 4473. Licensees are not required to use an e-Form 4473 and may continue to use the paper ATF Form 4473. ATF Ruling 2016-3 (Ruling), signed April 29, 2016, supersedes ATF Ruling 2010-8. The Ruling authorizes alternative procedures for the Acquisition and Disposition (A & D) recordkeeping requirements for licensed manufacturers. Licensed manufacturers are authorized to consolidate their records of manufacture and/or other acquisition of firearms with their separate firearms disposition records, provided all conditions in the ruling are met. Federal Firearm Licensees (FFLs) have asked ATF about documenting changes and/or conversions made to firearms during the manufacturing process in the required A&D record. ATF Ruling 2016-3 clarifies how and when to document changes/conversions made. When a licensed manufacturer changes the model, type, caliber, size and/or gauge of a frame, receiver, or assembly of a firearm, the firearm should remain logged into the A & D record until the changes and/ or conversions are complete. Once the change and/ or conversion is complete, the licensed manufacturer should log the firearm out of the A & D record as a disposition to itself using the licensed name and licensed number. The date of the disposition is the date of the change/conversion. Concurrently, the licensed manufacturer would record on a separate line the acquisition of the changed/converted firearm as an acquisition from itself on the same date as the date the change/conversion occurred. FFLs should reference a full version ATF Ruling 2016-3, available at https://www.atf. gov/firearms/docs/ruling/2016-3-%E2%80%93- consolidation-records-required-manufacturers/ download. Please remember the importance of maintaining complete and accurate A & D records available for inspection at the licensed business premises. On August 1, 2016 the Bureau of Alcohol, Tobacco, Firearms and Explosives (ATF) published ATF Ruling 2016-5 (Ruling). The Gun Control Act (GCA) regulations at 27 CFR 478.92 require a licensed manufacturer to identify firearms by engraving, casting, stamping (impressing), or otherwise conspicuously placing or causing to be engraved, cast, stamped (impressed) or placed on the frame or receiver thereof an individual serial number and other identifying information required by the regulation. Similar marking requirements appear in the regulations implementing the National Firearms Act (NFA) at 27 CFR 479.102. Pursuant to these sections, the ATF Director may approve an alternate means of identifying destructive devices if the manufacturer shows the prescribed methods would be dangerous or impracticable. Further, regulations at 27 CFR 478.22 and 479.26 authorize the ATF Director to approve an alternative method or procedure to the marking requirements if certain determinations are met. If a licensed manufacture wishes to deviate from the marking requirements in the noted regulations, he must obtain a “marking variance” from ATF which grants him permission to do so. the requirements specified in 27 CFR 478.92 or 27 CFR 479.102. Type 10 FFLs have noted that applying for and awaiting approval on marking variances for destructive device munitions manufactured for a valid USG contract has caused problems with coordinating export licenses and creates difficulties in fulfilling USG contracts in a timely manner. or procedure to the firearms marking requirements contained in Title 27, Code of Federal Regulations (CFR) 478.92 and 479.102. ATF implemented an alternate marking method for destructive devices to solve many difficulties posed by this process and lower administrative costs and not have an impact on public safety. ATF authorizes licensed manufacturers of certain destructive device munitions that are manufactured for and transferred to the U.S. Government (USG) to mark these destructive device munitions with sequential lot numbers, provided that the conditions set forth in the Ruling are met. The Ruling applies only to those destructive device munitions that are explosive, incendiary, or poison gas, bombs, grenades, rockets having a propellant charge of more than 4 ounces, missiles having an explosive or incendiary charge of more than one- quarter ounce, or mines. The destructive device munitions must be manufactured to fulfill a current USG contract and the licensed manufacturer must currently be a party to that existing USG contract. If all conditions in ruling 2016-5 are met, licensed manufacturers are not required to submit marking variances for alternate means of identifying said destructive device munitions that are manufactured and transferred to the USG. 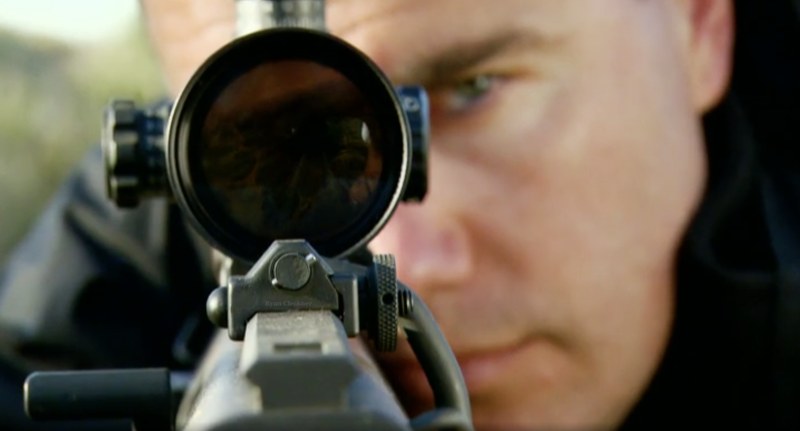 ATF continues to work with type 10 licensees to implement this Ruling and has established online guidance, available at https://www.atf.gov/qa-category/ atf-ruling-2016-5-guidance-marking-variance- government-defense-contractors, to assist licensees with this Ruling. Industry members may also contact ATF’s Firearms Industry Programs Branch (FIPB) at FIPB@atf.gov or (202) 648-7190. Also, ATF continues to work with USG contractors on related issues and concerns regarding destructive devices manufactured under a USG contract. ATF is developing internal training for Industry Operations Investigators to familiarize them with the unique operations and issues presented by licensees/contractors primarily producing destructive devices/destructive device munitions for the USG. The ATF Form 4473 (form) has been revised and mandatory use of the form became effective on January 16, 2017. The April 2012 version became obsolete on this effective date and may no longer be used. The new form can be obtained by contacting the ATF Distribution Center at (703) 870-7526 or (703) 870-7528. When requesting this form, please specify “ATF Form 4473 (5300.9) Revised October 2016.” The form may also be ordered online, available at https:// www.atf.gov/distribution-center-order-form, or may be printed from ATF’s website, available at https://www. atf.gov/firearms/firearms-forms, and copies made as needed. Please note that all six pages of the form must be printed and retained as a part of your permanent records. (https://www.atf.gov/contact/atf-field-divisions) should you have further questions or require additional clarification. Added a Warning Section at top of Page 1 that makes clear that the form must be prepared at the licensed premises including qualifying gun shows or events, unless the transaction qualifies under 18 U.S.C. 922(c). Question 1: Added requirement that if the legal name contains an initial only, “IO” should appear immediately after the initial (the quotation marks must be entered on the form). Question 10.b: Makes clear the transferee must answer both Question 10.a and 10.b. Question 11.e: Added a warning that the use or possession of marijuana remains unlawful under federal law regardless of whether it has been legalized or decriminalized for medicinal or recreational purposes in the state where the transferee resides. visa will answer “Yes” to Question 12.d.1. All other persons will answer “No”. All persons will answer question 12.d.2 as such: U.S. citizens and all persons other than aliens admitted to the United States under a nonimmigrant visa will answer “N/A”; and all persons admitted to the United States under a nonimmigrant visa will answer “Yes” or “No” depending on whether the nonimmigrant alien meets one of the exceptions pursuant to 18 U.S.C. 922(y) such as possession of a valid hunting license or permit. Question 19.d: Added a check box for an “Overturned” NICS response. Question 19.g: Added an optional space for the licensee to record the name of the licensee’s employee completing the NICS check. individual who will receive the NFA firearm(s), as reflected on the approved NFA application. The licensee must conduct a NICS check if transferring an NFA firearm that has been approved for transfer to a trust, or to a legal entity when no background check was conducted as part of the NFA approval process on the individual who will receive the firearm. Section D: Requires licensees to complete this section even if the firearm(s) is not transferred. Question 32: Added a requirement for licensees to check the box if the transaction is to facilitate a private party transfer. Licensee Certification updated for Question 33.
long gun to a person under 18 years of age for use at an on-premises shooting range. The on-premises rental of National Firearms Act (NFA) firearms is also permitted. However, licensees and non-licensees are prohibited from renting or lending firearms or ammunition to a person knowing or having reasonable cause to believe the person is prohibited from receiving or possessing that firearm. Refer to 18 U.S.C. § 922(d) and 27 CFR § 478.99(c). has received a waiver from the Attorney General of the United States. Permanent resident aliens, and aliens lawfully admitted to the U.S. without a visa (e.g., Visa Waiver Program) do not fall within the prohibition, and therefore do not need to meet one of the above exemptions to rent a firearm. The FFL must log the firearm out of the A&D record as a disposition to the transferee. An alien admitted to the U.S. under a nonimmigrant visa may rent a firearm for use away from the premises provided the above conditions are met, the alien falls within one of the above listed exemptions, and has a valid identification document. However, under Federal law, a person may not transfer a firearm to an alien in possession of a waiver issued under the provisions of 18 U.S.C. 922(y)(3), unless the alien meets one of the exceptions found in 18 U.S.C. 922(y) (2). Permanent resident aliens and aliens lawfully admitted to the U.S. without a visa (e.g., Visa Waiver Program) do not need to fall within one of the above exemptions to rent a firearm for use off-premises. However, the alien must have a valid identification document. The rental of an NFA firearm for use off-premises is allowed under certain additional conditions. These transactions are considered a “transfer” and are subject to the transfer provisions of the National Firearms Act, as well as the Gun Control Act. This includes a strict prohibition on the transfer of machineguns imported or manufactured on or after May 19, 1986, to non-government persons. The firearm must be registered to the transferee. For additional information concerning the rental of NFA firearms, please contact the NFA Division at (304) 616-4500.
the firearm, the FFL, if having not already done so, must log into E-Check to obtain the current NICS status before transferring the firearm and accurately completing Form 4473, thereby complying with 27 CFR 478.124(c)(3)(iv). a wide variety of questions, comments, or issues to the NICS Section. An FFL will be asked to provide his/her FFL number and contact information for validation. The NICS Section would like to provide a few important tips that will help eliminate confusion and frustration for both the FFL and his/her customers. is likewise found under “Resources for Federal Firearms Licensees”. or denied is a good candidate for a Unique Personal Identification Number (UPIN) under the Voluntary Appeal File (VAF) program. To save your customer time and frustration, suggest the appeal process only to clear up a delay or denial. During this process, the NICS Section will provide the VAF information to the customer if deemed appropriate for their situation. Does your event qualify as a Gun Show? A Federal firearms licensee (FFL) may conduct business as prescribed by the Attorney General temporarily at a gun show or event under the Gun Control Act, 18 U.S.C. § 923(j). 2) The sponsoring organization is devoted to the collection, competitive use, or other sporting use of firearms, or is an organization or association that sponsors functions devoted to the collection, competitive use, or other sporting use of firearms in the community. Can I obtain an FFL if I plan to primarily sell/trade firearms at Gun Shows? Yes. A Type 01 FFL (dealer) allows the licensee to conduct business if the applicant has in a State, where licensed, business premises. As long as the FFL maintains a business premises, the FFL may conduct business at bona fide gun shows. If, during a subsequent inspection, ATF discovers that a licensee has sold firearms only at gun shows, over the internet, or by mail order, will that fact alone be grounds for revocation or denial of an application for renewal? No. However, as discussed above, the FFL must maintain a business premises and comply with all statutory and regulatory requirements. The ATF website includes information and updates for the FFL industry at www.atf.gov. To contact your local ATF office go to: https://www.atf. gov/contact/atf-field-divisions.